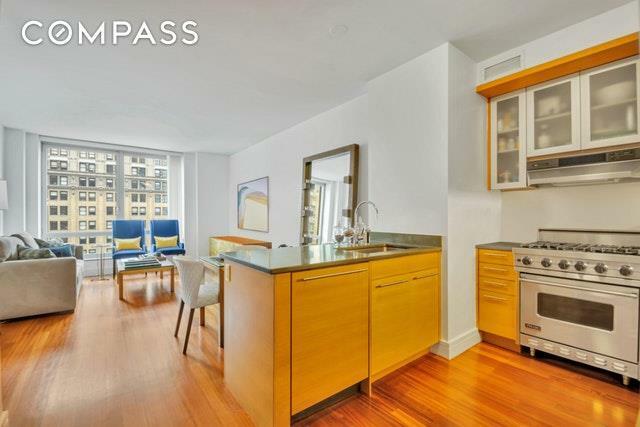 Fabulous light & open high-floor 1 bedroom, 1.5 bath apartment in Battery Park City, perched on the 27th floor of Manhattans first "green full-service luxury condominium, Millennium Tower Residences! 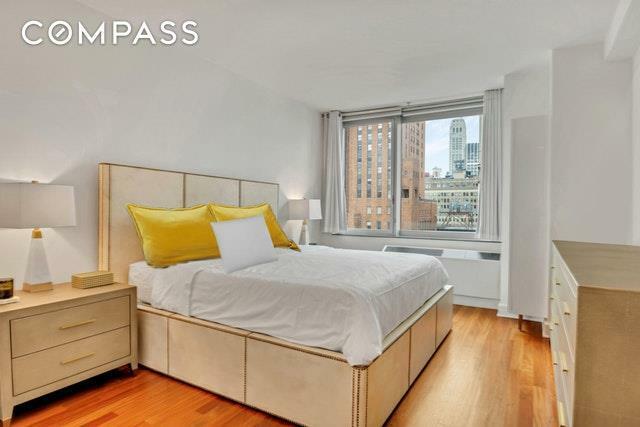 Large and sunny with east-facing floor-to-ceiling windows, Residence 27D boasts 875 square feet of elegantly-designed living space with Brazilian cherry hardwood floors, refined modern appointments, and a convenient vented washer/dryer. Gracious living and dining is complemented by an open chef's kitchen appointed with sleek cabinetry, Pietra di Bedonia countertops, and top-of-the-line appliances with a Viking gas range, Sub-Zero fridge and Miele dishwasher. The oversized master bedroom is sunny and serene with an en-suite bathroom and 2 large closets.Designed by Handel Architects, the 35-story Millennium Tower is a LEED Gold Certified building featuring solar rooftop panels and recyclable construction materials. Residents enjoy a full suite of amenities including 24-doorman & concierge service, a live-in super, 3 elevators plus a service elevator, a lounge, state-of-the-art 1500 SF fitness center, onsite parking garage with valet, childrens playroom, bike room and storage. 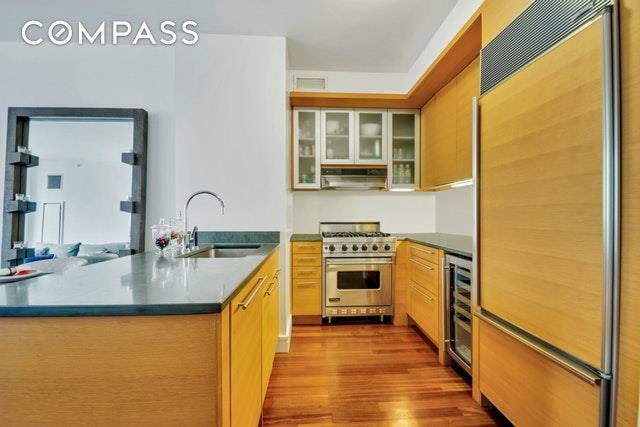 Ideally situated at the intersection of Little West Street, just north of Millenium Point, in picturesque South Battery Park near numerous parks and the breathtaking Hudson River Promenade, stretching 10+ miles along Manhattans west side with bike and jogging paths. Youll surely frequent the amazing Brookfield Place minutes away - a world-class retail, culinary and cultural center with chic shops, the European-style Le District marketplace, an enormous French market, waterfront dining and fine chef-driven restaurants. Westfield is another local favorite, presenting the delectable fare of Eataly plus a wide variety of shops. 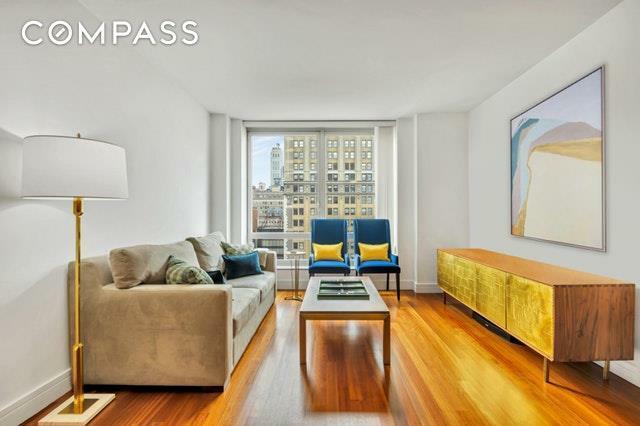 Also close by are the 1, 4, 5 and R subway lines, West Side Highway and FDR Drive for easily getting in and out of town. Pets are allowed at Millennium Tower! Please email me today to schedule a viewing of this special home.